This marks the first of what will be a long-running series of reviews of products sent to me by my pen friend Carmen. She spent some time in Europe this summer, and sent me an envelope packed to the gills with pens when she got back. Thanks so much Carmen! 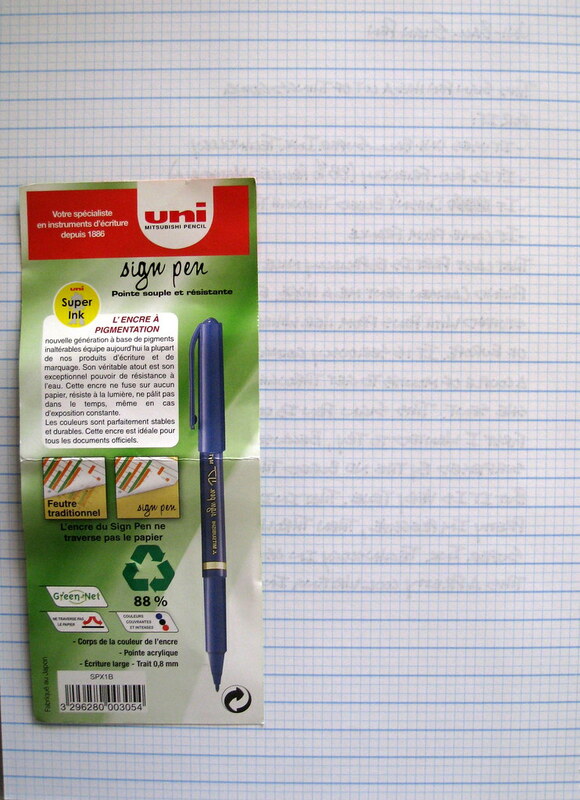 This Uni-Ball Sign pen was one of the first that caught my eye, mainly because I had never seen a product like this from Uni-Ball before. In fact, I am hard pressed to find any information online at all, including browsing through a half dozen country sites via UniBall.com. I am very impressed with how Uni-Ball is pushing their Super Ink technology across several different product lines, not just the Signo 207 line. 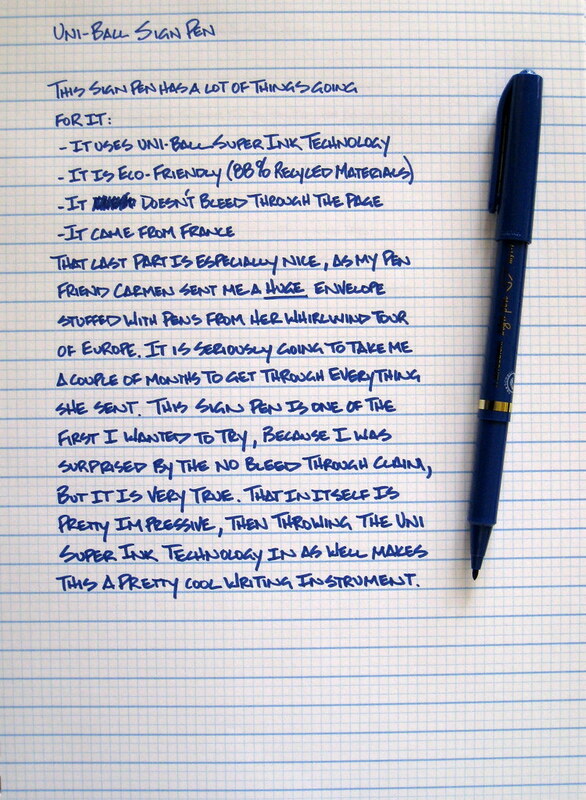 Seeing the Super Ink logo on this type of pen is pretty cool. The other big selling point of this pen is that it is not supposed to bleed through the page. I have to say, I wanted to see some results before I actually believed it, but it performs exactly as promised. I have an extra photo of the back of my Doane Paper page below where you can see there is no bleed, including the area where I scratched out a word on the page. Did I mention it is eco-friendly as well? It is, with the barrel being made from 88% recycled materials. Never did I think I would find a sign type pen with this much going for it, but the Uni-Ball Sign Pen packs quite a punch. Hopefully we will see these in the States before too long. Posted on September 21, 2009 by Brad Dowdy.